Q: According to reports, the Japanese Coast Guard said that the Panamanian ship involved in the ship collision accident in the East China Sea has now moved into the Japanese waters, and that when they asked the Chinese Coast Guard if they could help with the search and rescue efforts, the Chinese Coast Guard said that they didn't want any help from Japan. What is your comment? A: I don't know the source of the report you quoted. I want to tell you that since the accident happened, the Chinese government has attached great importance to relevant search and rescue efforts. While keeping people informed of the developments of the accident, we also stay in close communication with the other relevant parties. We welcome and are open to other countries' participation in the search and rescue efforts, and ships from Japan and the ROK are engaged in those efforts. Q: Premier Li Keqiang has concluded his official visit to Cambodia. Can you brief us on the consensus reached by China and Cambodia and outcomes achieved during this visit? This year marks the 60th anniversary of the establishment of diplomatic ties between China and Cambodia. What is the significance of this visit to the further growth of China-Cambodia relations? A: Premier Li Keqiang has wrapped up his official visit to Cambodia and returned to Beijing last night. This visit has yielded fruitful outcomes. I would like to avail myself of this opportunity to give you more details about it. Premier Li Keqiang's visit to Cambodia, which took place at the very beginning of a new year, was the first overseas visit of the Chinese leaders in 2018. This speaks volumes about the great importance China attaches to the China-Cambodia relations. During his visit, Premier Li Keqiang met with King Norodom Sihamoni and held talks with Prime Minister Hun Sen. The two sides spoke highly of the friendship and cooperation between China and Cambodia over the past six decades since the establishment of their diplomatic ties, and agreed to build on the past achievements and usher in a new future and jointly forge a strategic community of shared future. The two sides will maintain frequent high-level exchanges, strengthen strategic communication and support each other on major issues. We will continue supporting the Cambodian people in choosing the development path that suits their national realities on their own and providing assistance to help the Cambodian side maintain stability, achieve development and improve people's livelihood as our capacity allows. The two sides will seek greater synergy between their development strategies, jointly advance the Belt and Road Initiative, strive to achieve new trade growth target, promote such big projects as the Sihanoukville Special Economic Zone and speed up the construction of livelihood projects such as the roads, schools and hospitals in rural areas. We will enhance people-to-people exchanges, encourage more Chinese citizens to travel to Cambodia and vice versa, create more opportunities for the youngsters from both countries to learn from each other and cultivate more successors to China-Cambodia friendship. The two sides will also step up multilateral coordination, uphold the converging interests of the developing countries and make greater contributions to peace, stability and prosperity of the region and the world at large. During his visit, Premier Li Keqiang and Prime Minister Hun Sen jointly witnessed the signing of 19 bilateral cooperation documents, visited the picture exhibition in memory of the 60th anniversary of the establishment of China-Cambodia diplomatic ties, attended the launching ceremony of the Love Heart Journey program funded by China and inaugurated the projects of China-Cambodia Friendship Preah Kossamak Hospital and Tboung Khmum Provincial Hospital constructed under the assistance of China. Premier Li Keqiang's visit was paid when we celebrate the 60th anniversary of the establishment of diplomatic ties between China and Cambodia. The past six decades witnessed the enduring China-Cambodia friendship and the flourishing bilateral cooperation. With the outcomes of Premier Li Keqiang's visit being implemented step by step, the China-Cambodia Comprehensive Strategic Cooperative Partnership is bound to achieve even greater development. Q: According to reports, recently, in an e-mail survey sent to its members and on the registration page of its mobile phone app, Marriott Hotel listed Hong Kong, Macao, Taiwan and Tibet as "countries". Reports said that some Chinese departments have taken measures in response to the global hotel chain's behavior and initiated an investigation on that. What is your comment? A: I believe you have all noted the relevant situation. You may have also noted that the Chinese competent authorities have dealt with that and the head of the corporation you mentioned has made a public apology. I would like to stress that Hong Kong, Macao, Taiwan and Tibet are all parts of China, and this is the objective fact as well as the consensus of the international community. We welcome foreign corporations' investment and operation in China. Meanwhile, they should respect China's sovereignty and territorial integrity, abide by China's laws and respect Chinese people's national feelings. This is the minimum requirement for any enterprise to invest, operate and conduct cooperation in another country. Q: Could you give us some information about the Chinese leaders' attendance at the World Economic Forum in Davos? A: The Chinese side values the role played by the World Economic Forum in Davos as an important platform for countries to share their views on the macro-economic issues in today's world. We will release the information on the Chinese delegation's attendance at the Annual Meeting 2018 in due course. Q: According to reports, two French NGOs filed legal case against the ROK company Samsung in France on Thursday, over alleged use of child labor and other abuses in their factories in China. What is your comment? A: I am not aware of the information mentioned by you. In principle, I want to stress that the Chinese government always lays emphasis on safeguarding the legitimate rights and interests of laborers, and has taken a series of measures to effectively protect the entitlements of laborers in terms of law enforcement and administrative management. Q: The data that came out today suggested that last year there has been an increase in China's export to the DPRK although in December there was a decrease. Do you have more information about China's export to the DPRK? A: If you are interested in the trade data, I would refer you to the General Administration of Customs of China (GACC) for further information. The spokesperson of the GACC has offered a fairly detailed introduction on China's bilateral trade with certain countries today. If you are interested in the bilateral trade between China and the DPRK, you can ask them. Q: Yesterday, you made a response to Iran's claim that China did not help to rescue those missing Iranian crewmen. Does China agree to let the Iranian side dispatch professional teams to take part in the search and rescue efforts? A: China welcomes and is open to other countries' participation in the search and rescue efforts. 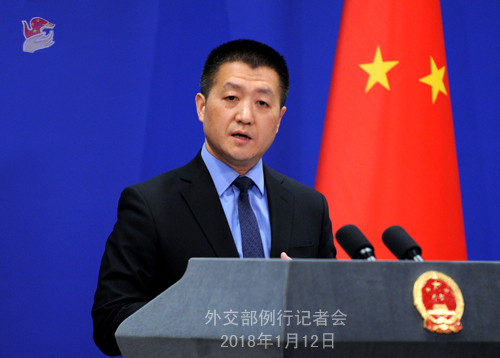 I would like to reiterate that since the accident happened, the Chinese government has attached great importance to it and made all-out efforts to conduct maritime search and rescue for the missing crewmen. When faced with security threats, the Chinese rescuers approached the tanker at the risk of their lives many times to search, rescue and fight the fire at close range. Meanwhile, China has coordinated with the rescue teams from Japan and the ROK. We will continue with the search and rescue efforts with a professional and responsible attitude. We hope that the relevant sides will learn about their information through such official channels as China's Ministry of Transport so as to get an accurate understanding of the developments of the search and rescue efforts. You mentioned Iran just now. 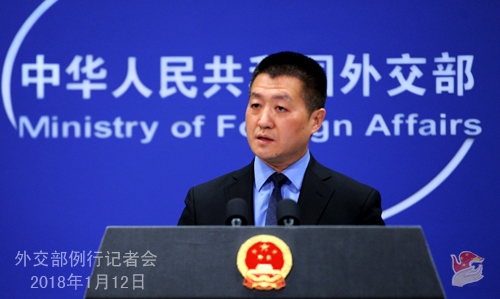 I want to tell you that China maintains unimpeded and effective communication with the competent authorities of Iran. According to the information I have received, China has assisted 12 Iranian professional rescuers in arriving in Shanghai at the fastest speed at the request of Iran. Now we are arranging for them to engage in the search and rescue efforts as soon as possible. In addition, yesterday, the officials from the Shanghai Maritime Affairs Bureau informed the Iranian Ambassador to China of the latest developments of the search and rescue efforts face-to-face in Shanghai. Follow-up: Has the Iranian rescue team arrived in Shanghai? A: I said just now that with our help, 12 Iranian professional rescuers have arrived in Shanghai at the fastest speed and that we will arrange for them to engage in the search and rescue efforts as soon as possible. Actually, the Iranian Ambassador to China had arrived in Shanghai earlier than them. This evening, the Ministry of Foreign Affairs and Beijing Municipal People's Government will co-host the 2018 New Year Reception for Foreign Correspondents in China in the Capital Museum which is imbued with culture charm. This is an annual event for bringing together foreign media friends based in Beijing and their Chinese counterparts. We are looking forward to seeing all of you there tonight.